Gary Neville and others whose astute words we’ve been listening to intently over the past few months. IDENTIFYING THE SEVEN best Premier League pundits over the course of the 2016-17 season was no easy task. Firstly, we set a couple of stipulations. To simplify the list to a degree, we restricted it to people who comment on the Premier League on TV on a regular basis. So, we’ve discounted pundits who are generally known for either working solely on Champions League coverage (sorry Roy Keane), or those who usually only comment on Premier League games on the radio (Eamon Dunphy, for instance). So with those rules in mind, we undertook the unenviable task of identifying the cream of the crop. Two attributes were particularly crucial in putting together this list — credibility and entertainment value/the ability to think outside the box and not simply regurgitate conventional wisdom. There would be endless candidates for this list were it just based on people whose views we agree with all the time, but what makes a pundit really worth listening to is an ability to be a bit more honest and risk upsetting people by speaking with both conviction and a degree of originality, while at the same time retaining a sense of authenticity. Check out our choices below and let us know which pundits you have been impressed by in the comments section. Jenas is still only 34, with injury problems cutting short his career in 2014. The former Newcastle and Tottenham footballer can consequently provide an invaluable insight into the modern footballer that some his older colleagues may not be able to relate to as much. Moreover, he is not afraid to challenge his fellow pundits and create debate — the difference of opinion with Alan Shearer above is a good example. If you define a good pundit as someone you agree with all the time, then you are unlikely to agree with the choice of Chris Sutton on this list. However, if you value entertainment over conservative views, then the admittedly divisive former Blackburn and Celtic striker may be for you. One of the most thoughtful and tactically literate pundits out there, Higginbotham may not have the name recognition of a Thierry Henry or a Jamie Carragher, but he is no less insightful despite a lack of big-game playing experience. Not too many pundits are comfortable engaging in the kind of technical, long-form analysis that he specialises in. Certain pundits’ words undeniably carry greater weight than others on account of what they achieved during their football careers. Rio Ferdinand is one such example, and unlike some of his esteemed colleagues, the ex-Man United player is not afraid of saying something controversial or upsetting current stars, as in the example above, where he amusingly lays into Paul Pogba and Jesse Lingard for their dressing room antics. Almost a combination of Roy Keane’s wit and Gary Neville’s sophistication, Carragher is comfortable looking at the analytical side of the game but is equally accomplished at delivering scathing put downs, such as his quip about Arsenal last month following their meek display at Crystal Palace: “What father would want his daughter to bring one of them home?” he memorably asked. At 64, Souness is one of the oldest pundits out there — Alan Hansen, who retired back in 2014, is three years younger than his fellow Liverpool legend. Yet the former Newcastle manager’s views remain as sharp as ever, and he invariably outshines his younger colleagues with consistently provocative and uncompromising opinions. Neville’s confidence may have taken a blow following his well-documented failure in management with Valencia, but the Sky Sports analyst remains one of the most well-regarded pundits on British television. 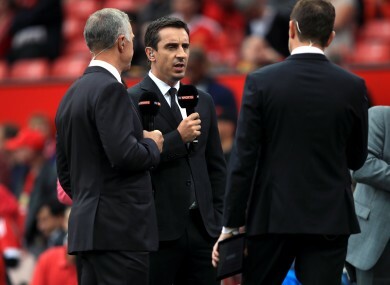 When the ex-Man United defender speaks, the football world usually listens, and Neville has great chemistry with Jamie Carragher in particular, making Sky Sports’ Monday Night Football must-watch TV particularly when the pair are on together. Email “Ranking our 7 favourite Premier League pundits from this season ”. Feedback on “Ranking our 7 favourite Premier League pundits from this season ”.